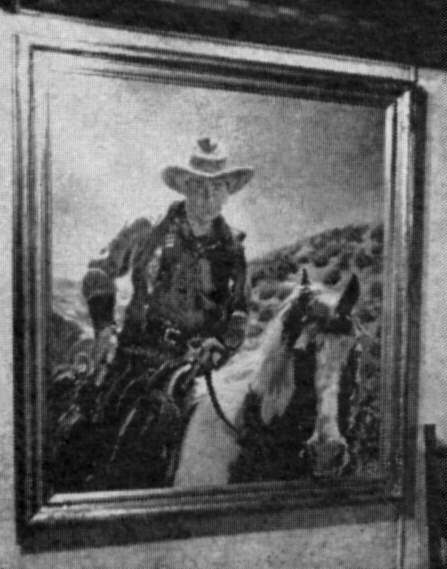 Most of Hart's movies were shot on location in Santa Ynez Canyon or Newhall, California, both within an hour of Los Angeles. Stunt men were almost never used, Hart did all his own fighting and riding and was often injured. In his earliest films, Hart rode a big, black gelding named Midnight. He tried to buy the horse from the stock company but they refused to sell. Hart then started using a small pinto gelding named Fritz. Soon, Fritz became almost as popular as Hart himself. Movie goers sent Fritz cubed sugar and wrote him fan letters. Fritz was never a docile horse, he and Hart had many power struggles over the years some resulting in kicked over cameras and damaged equipment. Hart was an excellent rider and never blamed Fritz for his less than professional behavior. Hart also owned a giant pack Mule, Lizabeth and a rank little bucking mare named Cactus Kate. After being stabled together for months, Fritz refused to work without his equine friends standing by. 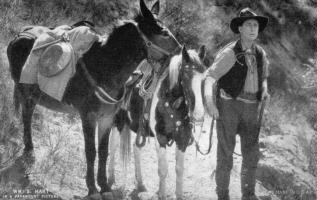 Hart spent as much time on foot as he did in the saddle in his movies. The tracking shot was not in use yet so running horses could not be filmed at their best advantage. The stunts were spectacular even if not filmed well. In The Narrow Trail, Hart rides Fritz across a fallen tree spanning 100 feet of a canyon. Fritz walked down the length of the tree with no problem the first time. However, a second take was required to get a close up. When asked to stand still on the round surface, Fritz lost his balance and fell several feet pinning Hart beneath him on the canyon floor. Fritz's hooves were only inches from Hart's head but the horse remained motionless until help came to reposition his legs so he could stand up. Hart always claimed Fritz knew the danger Hart was in and stayed still so as not to hurt Hart. Hart must have been fearless. For the movie Sand, Hart rode Fritz into a dark, water filled cave just to film them swimming out. Deep inside the cave, near the edge of the water, (which Hart judged to be about 60 feet deep at the deepest point) Fritz hit an unknown, underwater ledge which he tried to swim over. Instead, he went over backwards, unseating Hart in the cold, dark water. Fritz then panicked and tried to run up the sides of the dome shaped cave falling backward into the water over and over again. Hart located Fritz from the sound of his trashing, remounted, and was able to guide Fritz safely out of the cave. After several such experiences, Hart decided he could no longer use Fritz in his movies. He cared about the horse too much and could not risk his safety in such dangerous stunts. Besides, Hart didn't feel he could do his best for his fans if he was always worrying about Fritz. Fritz's swan song, his final stunt before retirement, was in Singer Jim McKee. The horse jumps over a cliff, falling and rolling into the gorge below. Surveying the area, Hart located a prepuce about 12 feel below the cliff, from there to the bottom of the gorge was about one hundred and fifty feet. Fritz had never been doubled in any of his movies - his brown and white coat pattern was too distinctive for substitution. Hart had tried to have dummies of Fritz made before to be used as a staked down wild horse or as a dead horse but they never turned out well enough. This time, Hart called in the experts to build a hand painted model of Fritz complete with joint springs and a real mane and tail. It weighed about 1000 pounds and was made to Fritz's exact measurements. The stunt was done by having Fritz jump down to the prepuce and fall. Then Hart mounted the dummy which was suspended by piano wire. When the film started to roll, the wires were cut sending Hart and the dummy tumbling to the bottom of the gorge. 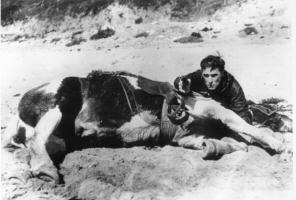 Hart had to go before the New York Board of Censors over the scene - they were sure a live horse had been used and killed in filming this realistic scene. 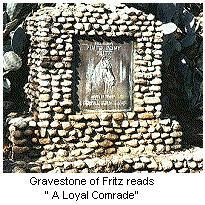 Fritz is buried under the hill at La Loma, a huge stone monument marks his grave. 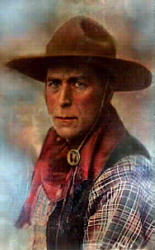 Hart was filmed speaking only once and that was for the reissue (with sound track) of his last movie Tumbleweeds in 1939. Fritz had died the year before at 37. Hart talked about his love of movie making and recited a poem he had written. that nothing seems to live between it and silence." Whoever else William S. Hart was, he was certainly a man who loved his horse and making western movies. UPDATE: December 2002 - from a volunteer of the William S. Hart museum. "We have Fritz's age at death as 31 not 37 years". Note from Deb at Horse Fame:"I have no document available to see where Sharon's source of information came from. It is possible hand written (seven and one are very similar) documentation of that era may have been a a problem or typing error. Sorry for not knowing the exact age". James Montgomery Flagg, is the artist, and Mr. Hart's personal friend, who created the portrait of Hart and Fritz which hung in the livingroom of Hart's home.